I got out for a walk this morning, encouraged by the promise of sunshine and also beginning to feel more like I was walking instead of thinking about every step to the exclusion of everything else. 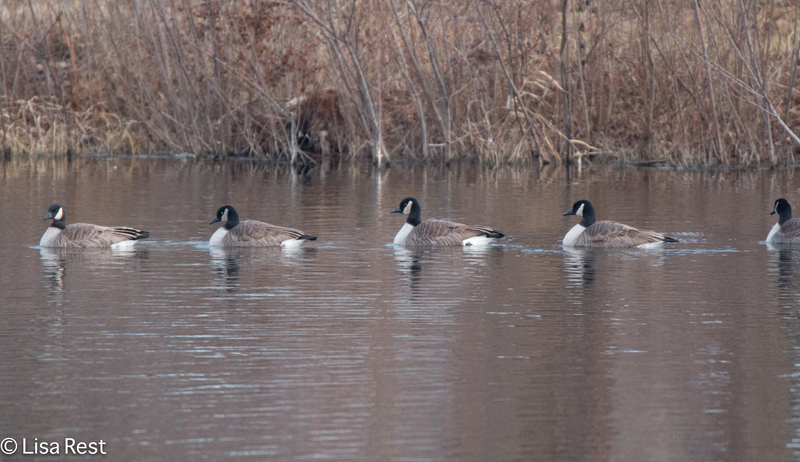 It’s been bothering me that I missed the Christmas Bird Count at Fermilab last weekend, so when I passed by Cermak Woods on the way home yesterday from grocery shopping, I noticed a lot of Canada Geese were gathered there, and decided to go back and count them this morning. It’s not an official count, of course, but the data all goes into ebird anyway. The sunshine was late in coming but so was I, yet it didn’t seem to matter. 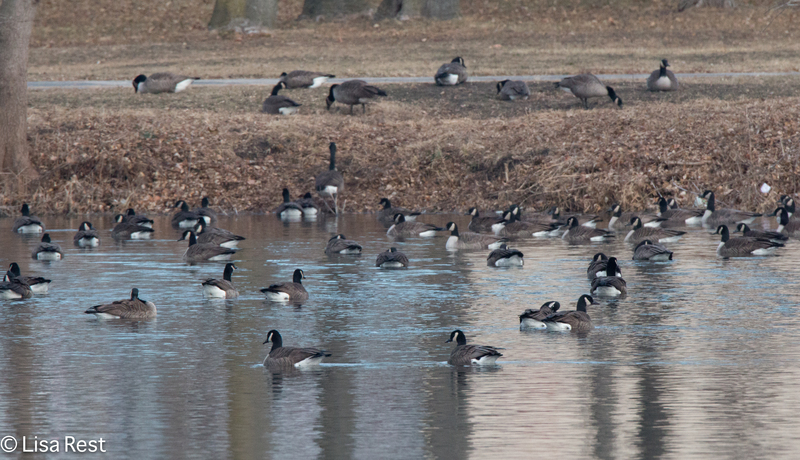 There were roughly 100 Canada Geese at Cermak Woods. No Greater White-Fronted Geese, no Cackling Geese, not even a Mallard or two. But I was encouraged by the fact that I managed to operate the camera and the huge lens, having fallen out of practice. So I continued on to the Chicago Portage. All was quiet at the Portage until I started to walk slowly in from the south entrance which is my usual approach. 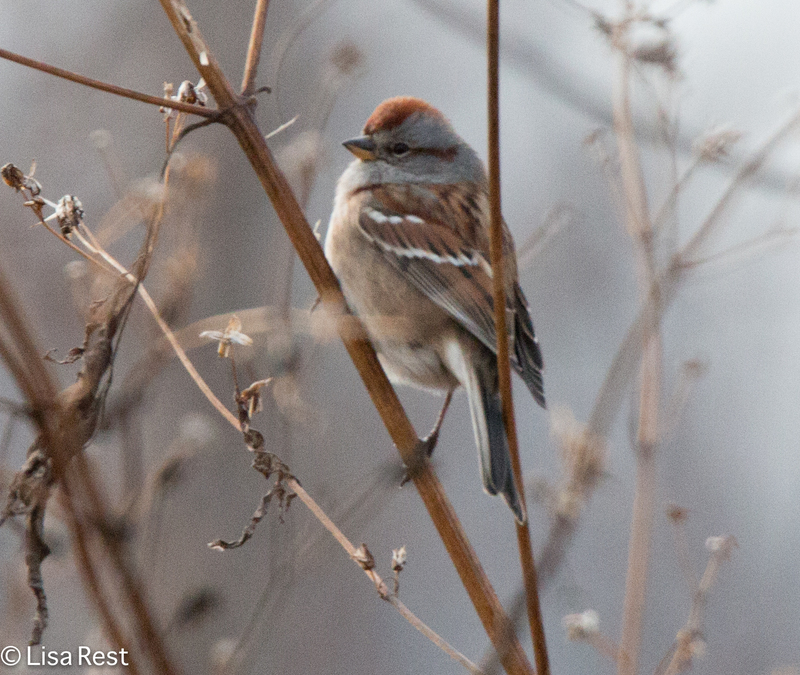 I heard Black-Capped Chickadees and then began seeing lots of American Tree Sparrows, Dark-Eyed Juncos, a few American Goldfinches, and I had some White-Throated Sparrows in there too. 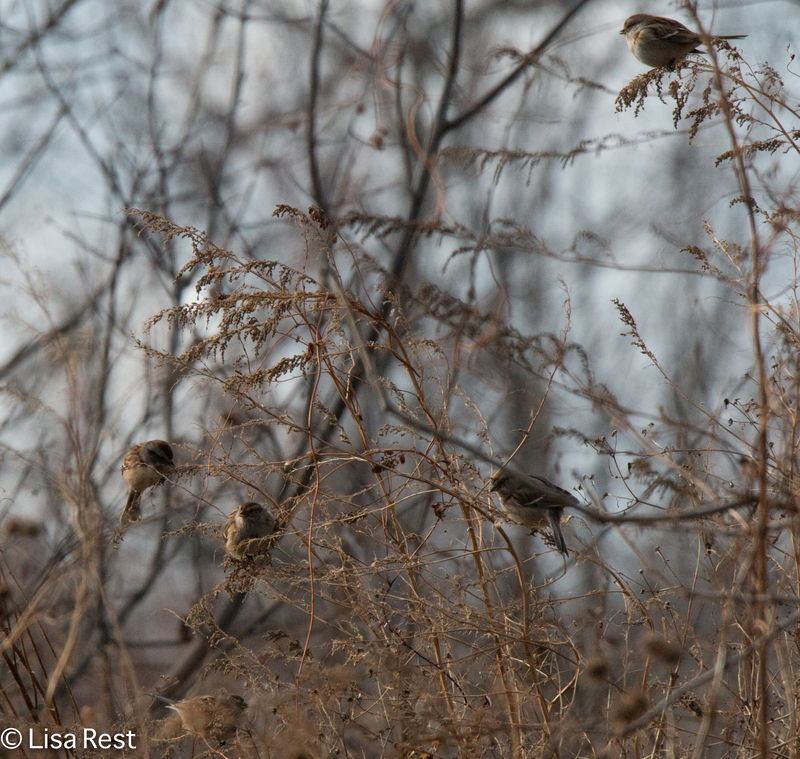 The last time I went to the Portage there were a lot of Tree Sparrows. I cannot ever remember seeing them at the Portage in previous years, so this must definitely have to do with the removal of trees changing the habitat to suit them. Geese started arriving at the Portage in groups shortly after I did. 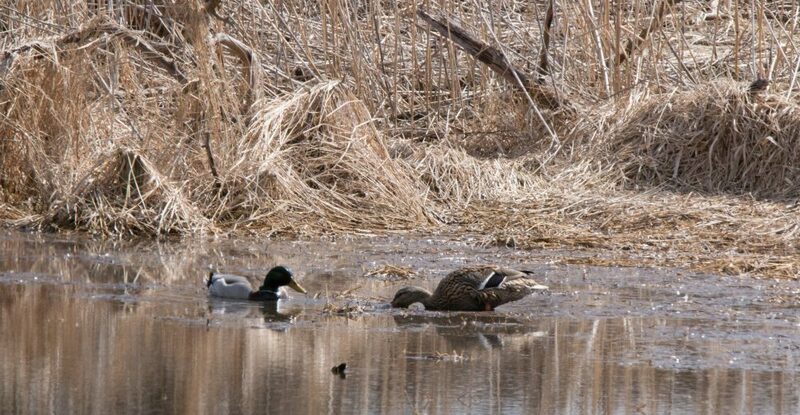 Since they were flying in from a direction opposite where I’d come from at Cermak Woods and they were landing in the water, I started counting them as they came in. If it were not for the BirdLog Application, I could never do this, but it’s very handy. The only thing hampering my efficacy at this point was the fact that it was cold. I had on long underwear but my hands were pretty chilly, especially every time I removed my gloves to enter more birds to the count. 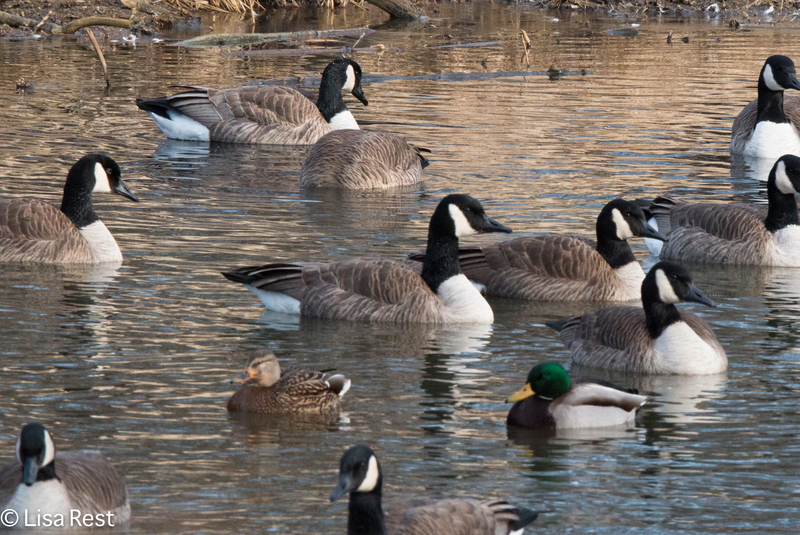 There were a total of five Mallards mixed in with about 100 geese. 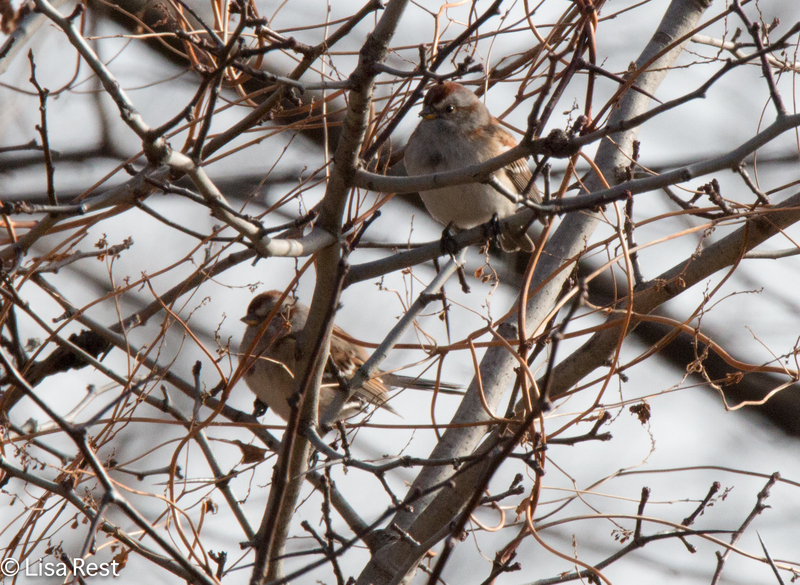 I thought I heard Fox Sparrows, and then was lucky enough to get a recital from the bird below. I didn’t have my handheld recorder with me but I managed a quick video on the smartphone which basically has no picture worth looking at but it recorded the song this bird was singing, along with a comment or two from a Canada Goose. 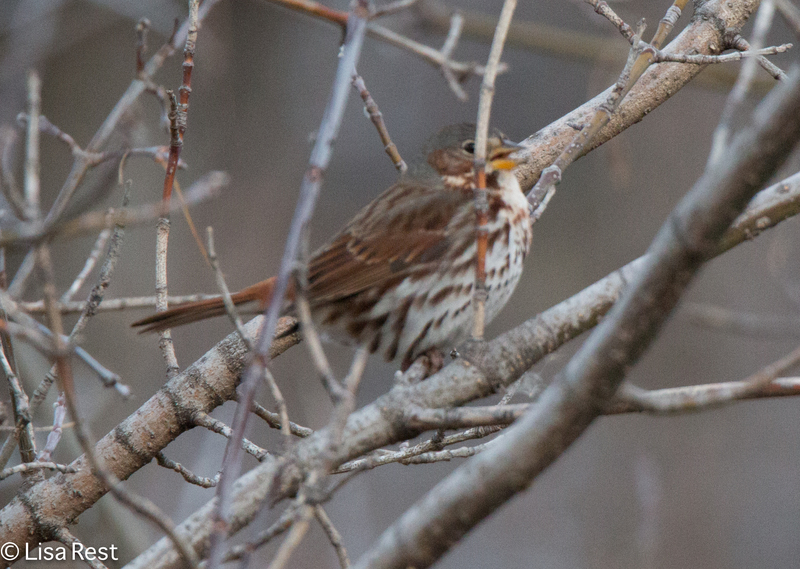 As it turns out the Fox Sparrow was the “rare” bird of the day. I wondered why ebird was asking me to verify the sighting and then checked the distribution on Sibley’s app, and the northernmost part of Fox Sparrows’ winter range in Illinois is somewhere around Springfield or the middle of the state. But with climate creep, I’m not all that surprised. Besides which we have so far had a pretty mild winter. 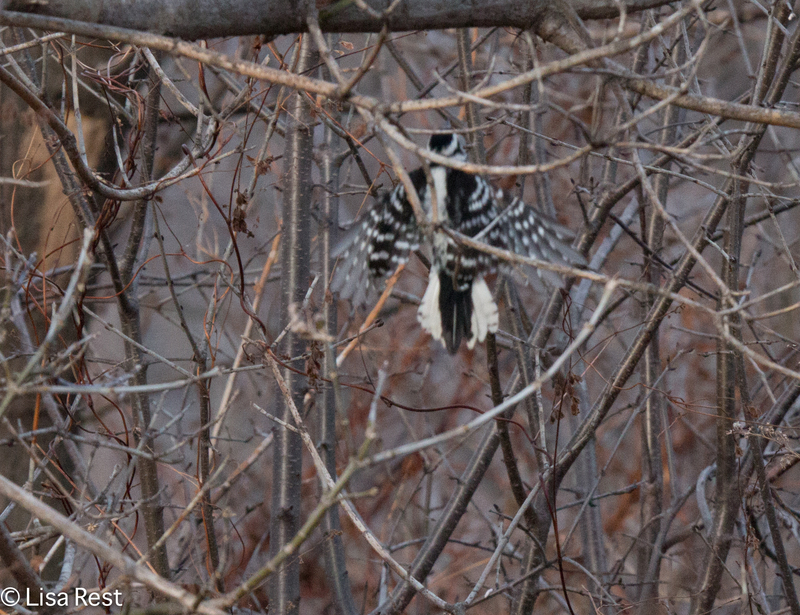 The two birds I see regularly all year around at the Portage are Downy Woodpeckers and Northern Cardinals, and neither one of them wanted to cooperate for a photo today. 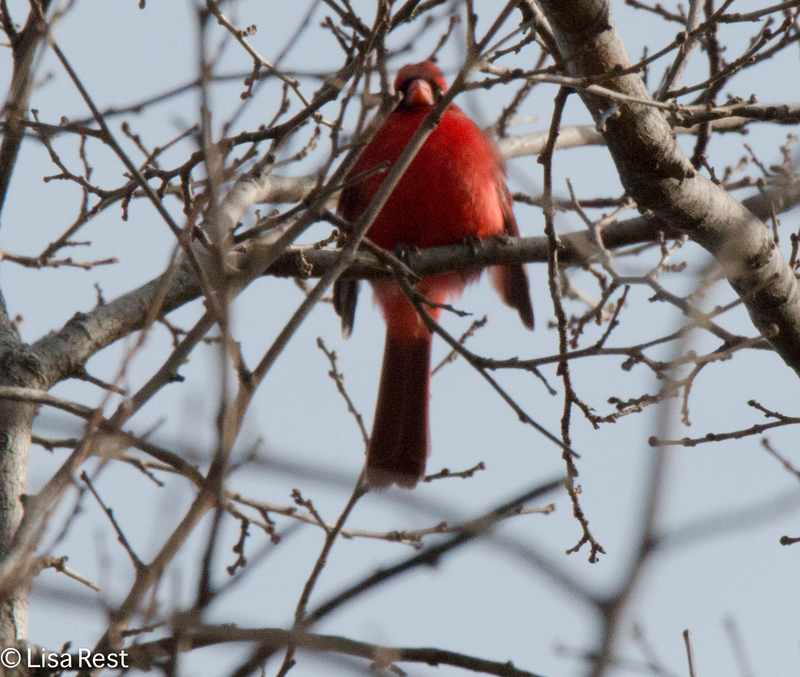 But I did find this one male Northern Cardinal trying to keep warm in the top of a sunlit tree. I’m actually looking forward to walking to the train tomorrow morning. I feel like my life has started over again. I still have a little pain and expect I will have more so I’m not going to overdo anything, but I am on the mend and that’s all I can ask for. Happy New Year! This entry was posted in bird love, bird song, birding, birds, photography, Sparrows and tagged American Tree Sparrow, BirdLog App, Canada Goose, Cermak Woods, Christmas Bird Count, Downy Woodpecker, ebird, Fox Sparrow, Mallard, Northern Cardinal, Sibley App, winter range by Lisa Rest. Bookmark the permalink. I am glad that you are on the mend. Your phone did a very good job of recording the fox sparrow. Thank you so much. The best thing about being sick is getting well. I’m happy about the phone recording too because I am not as familiar with this song as I am some of the others. Am so glad you are feeling better and are able to get back to birding. I have a suggestion that might help with the “cold hands while using electronic devices” problem. Head Company sells “running” gloves with special finger ends to allow input to phones, pads, etc. without removing the gloves. I bought a pair at COSTCO this fall for about $10. They are aren’t the warmest gloves but are far better than bare hands! Will send pictures of the gloves to the email address you used for our Operation Ruby Throat trip since I don’t know how to insert photos into blog comments. Why thank you, Ethelyn! What a great idea. Come to think of it I saw a guy sitting in the shelter at the train station this morning doing stuff on his phone with gloves on. I got your picture! Thanks so much! My regular gloves aren’t too warm either. We had a windchill of 0 this morning. Brrr.